Determining an effective Facebook advertising frequency ought to be a critical concern for any business that uses the platform to reach out to its customers. Companies that fail to adequately address this question put themselves at risk of ad fatigue, or worse, under saturation. For this reason, we shall provide some tips and tricks for companies that want to implement a pragmatic and sustainable cadence on Facebook Ads that fundamentally drives revenue. The article that follows will address frequency and its various components, how to determine if ad fatigue is impacting campaign performance, and how to combat frequency-related issues. What is Ad Frequency, anyway? To get things started, let’s take a look at how Facebook defines frequency. Let’s also examine how frequency is determined and how users can slice and dice the data to better understand the performance of their campaigns. Frequency Defined: Facebook’s definition of frequency is the average number of times each person saw a specific ad. It should be noted that this is an estimated metric, meaning it is not an exact number. Furthermore, because it is an average, it is also the case that some people in the audience were reached more often than others. Facebook calculates an advertisement’s frequency with the following formula: Frequency = (Impressions/Reach), where Impressions is how many times the ad has been shown, and Reach is how many unique users the ad has been shown to. 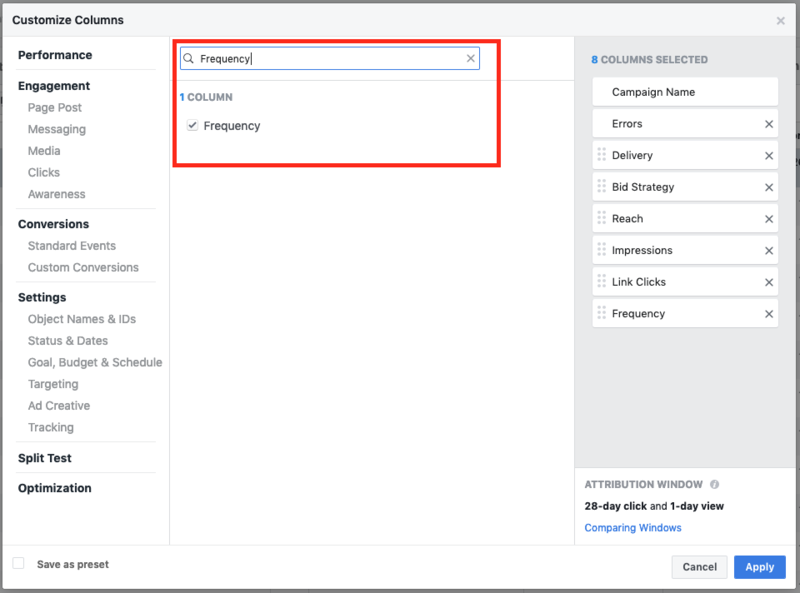 Determining Frequency: The Facebook Ads Manager allows users to include frequency metrics in any reporting view – campaign, ad set, or ad level. 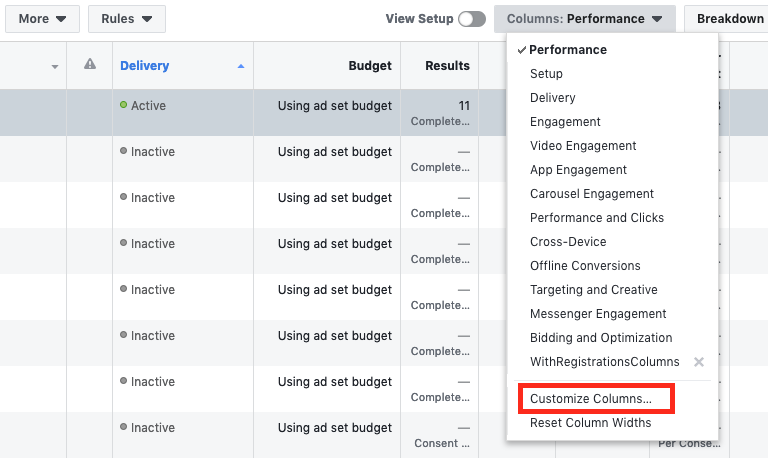 At the top right of the Ads Manager page, users will see a button called “Columns: Performance.” By clicking here, and then selecting “Customize Columns,” they will be given the ability to display the frequency, alongside any other metric that Facebook provides, including impressions and reach. Digging Into the Details: The Facebook Ads Manager also enables users to get a little more intimate with the data. For instance, for any given ad campaign, they can take a look at the frequency for various reporting periods. This will enable users to examine daily fluctuations in frequency, and compare it to the overall frequency of the campaign generally. Cumulative Frequency: Users can also take a look at a campaign’s cumulative frequency. This indicates how the frequency has increased each day to accumulate for the campaign over time. As such, it is a critical tool for determining the points where companies begin to saturate their audiences. 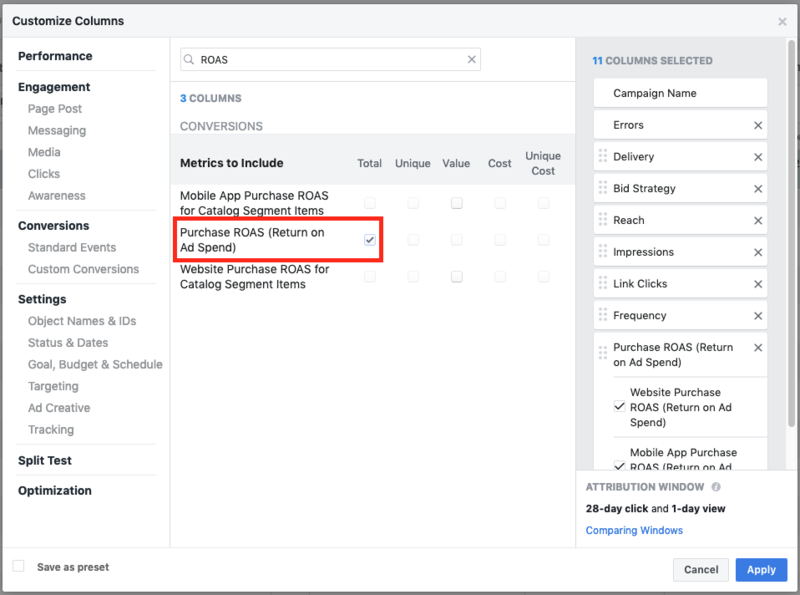 How to view the cumulative ad frequency: First click on “View Charts” below your campaign, then on Custom, then on Actions and choose Frequency (cumulative). How is Ad Frequency Impacting Campaign Performance? No matter how creative, engaging, or aesthetically pleasing an advertisement may be, it is always at risk of inducing what we in the industry refer to as “ad fatigue.” The basic idea is this: as a campaign’s frequency gets too high, it causes the audience to become less responsive to it. As such, it is absolutely necessary for businesses to be cognizant of when their campaigns begin to disengage target audiences. Needless to say, the best way for businesses to combat ad fatigue is to identify it. So, what are the symptoms and how are they identified? Well, it’s important to start by examining return on ad spend (ROAS) and other core campaign metrics. For example, ad fatigue decreases relevance scores, which then increase cost-per-mille (CPM) and cost per results. Ad fatigue will also decrease the number of results that campaigns achieve. Ultimately, these factors will have a negative impact on overall ROAS. If a campaign is not ROAS-positive, meaning the revenue it generates is less than the amount that is spent on the campaign, that is an indication that the campaign is decreasing in performance. Review “CRFC” Metrics: The next step here is to analyze the specific ads in the campaigns that aren’t ROAS-positive. To do this, users should examine the changes in cost per result, relevance scores, frequency, and CPM (CRFC). It is best that companies examine the changes over a 7-day period to assure they are not getting a misread on the trends. Aside from declining ROAS, a campaign that is suffering from ad fatigue will have a high frequency. This will decrease relevance scores, which in turn will increase CPM and cost per result. The million dollar question is “What is the Ideal Facebook Ads Frequency?” However, the answer couldn’t possibly be one-size-fits-all. Indeed, a more pragmatic question might be “What steps can be taken to avoid ad fatigue and maximize the potential of any given campaign?” We have three recommendations. If frequency becomes an issue, businesses ought to change the ad creative, swap out the underlying offer, and target different audiences. Let’s go over these three recommendations individually. Change the ad creative: Often times the key to curing ad fatigue, and thus solving frequency-related issues, is as simple as updating the ad creative. That is: refresh the imagery, switch the format, come up with a new headline, play around with the color scheme, etc. The only critical factor here is to make sure the new ad is completely different from the previous one. It is not enough to change the call to action and call it a day. This is especially true if businesses intend to continue targeting the same audience. Swap out the offer: Another simple trick that companies can do to address Facebook Ads frequency issues is to change the offers contained in the ads. While it can be tempting to repeat winning strategies, dwindling ROAS demands change. Indeed, one good strategy is to cast a wide net. Businesses can create multiple offers within one campaign to appeal to the most responsive segments of any given audience. Target different audiences: Sometimes an audience has simply been tapped out. Alternatively, it could be that the audience was never right in the first place. In such cases, no amount of advertisement rejiggering can re-engage them or improve frequency issues. Businesses that fail to achieve a positive ROAS, or otherwise struggle with frequency, ought to consider developing new audience personas. This is generally where we here at 42matters come in. As it turns out, businesses can build incredibly incisive audience personas by tapping into the applications that people download on their mobile devices. By leveraging our extensive application database, the Audience Finder by 42matters enables companies to create precise audiences for Facebook advertising campaigns that are guaranteed to reach their desired consumers and fundamentally contribute to revenue. How Can The Audience Finder by 42matters Cure Frequency-related Issues? Let’s say an online fashion shop has been running Facebook Ads campaigns that consistently return poor CRFC metrics and are rarely ROAS-positive. Let’s also assume that they have done a good job shaking up their ad creative and concocting new offers. As is typically the case in such circumstances, the fashion company has determined that the frequency issues they are experiencing are due to an exhausted audience. To address this issue, the fashion company turns to the services of 42matters’s Audience Finder and creates an audience persona based on folks who have downloaded their competitors’ fashion shop apps. 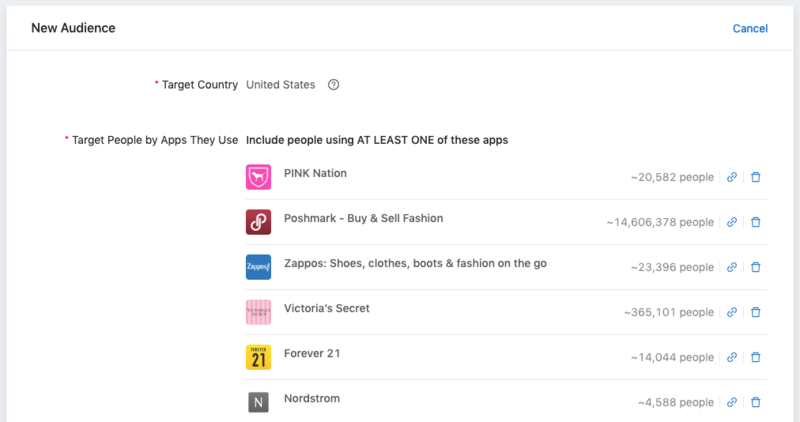 These apps include Poshmark, Zappos, Victoria's Secret, and many others. There are no limits to how many apps they can select, so no user is out of reach and any niche can be targeted. 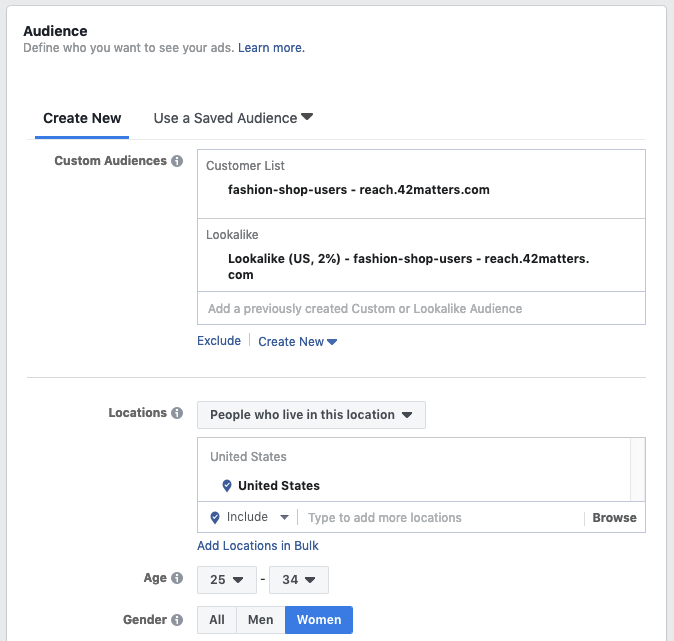 The Audience Finder uploads the custom audience into their Facebook Ads account and also automatically generates a look-alike list to maximize the potential reach of the data. The fashion company is only one click away to launch a fresh campaign. By implementing the Audience Finder in conjunction with Facebook Ads, they are able to take direct aim at their competitors, reach a far more engaged audience, and assure that the time and money they spend on advertising is fundamentally contributing to revenue. Moreover, they can always combine the custom audience with other Facebook targeting options e.g. gender and age. When determining the ideal Facebook Ads frequency, vigilance is everything. Indeed, there is no simple answer. So, for companies to arrive at the most appropriate solution based on their particular circumstances, they will have to experiment. In order to do so, they will need to understand what frequency is, how to identify ad fatigue, and the best ways to improve inadequate campaign performance. By familiarizing themselves with the contents of this article, companies will be better positioned to find their ideal Facebook Ads frequency, maximize their ROAS, and outflank their less savvy competitors. An example of how highly accurate audience targeting fishing fans works in comparison to traditional targeting options on Facebook. Moreover, also how it can increase the specificity of your Facebook ad targeting. Using Facebook Ads Custom Audiences is the extra mile needed to reach your target audience efficiently. Get started and learn how to use these audiences right now!